Rovers forced to settle for a point on the road against ten-man Rochdale. Rovers threatened throughout the first half and came agonisingly close to the opening goal when Stefan Payne struck the crossbar with a thunderbolt of a shot from twenty-five yards. Rochdale were reduced to ten men in the dying moments of the first half, as ‘keeper Magnus Norman was shown his marching orders for a robust challenge on Stefan Payne on the fringe of the penalty area. 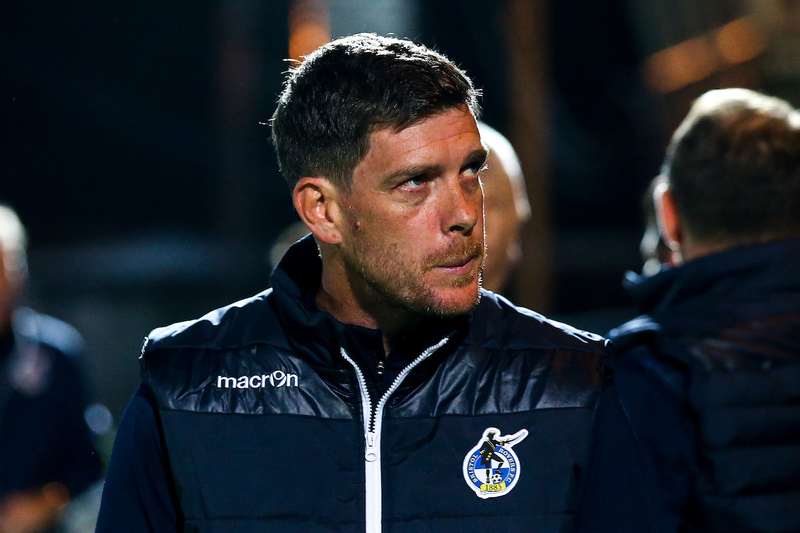 Substitute goalkeeper Josh Lillis made two saves in the second half to deny Rovers all three points – pushing away a point-blank finish from Liam Sercombe and again staying alert to tip wide a long-range effort from Sercombe inside the closing stages, as Rovers had to settle for a point. In naming his side for the second away trip in four days, Manager Darrell Clarke included five changes to the starting XI that faced Bradford. Following his cameo appearance on Saturday, Liam Sercombe was drafted into the line-up, as Tom Broadbent was named in defence. The other changes came in the shape of Kyle Bennett, Stefan Payne and Chris Lines. As the opening minutes played out it was the hosts that threatened first in the contest. Following a direct period of build-up play, Ian Henderson broke down the right and drilled a low cross into the mix that had to be gathered swiftly by Jack Bonham. Henderson had a lively opening ten minutes and again forged an opportunity when he broke into the area and glanced a header just wide of goal from ten yards. The initial stages of the encounter remained fast-paced and it wasn’t long before Rovers crafted an opening of their own. 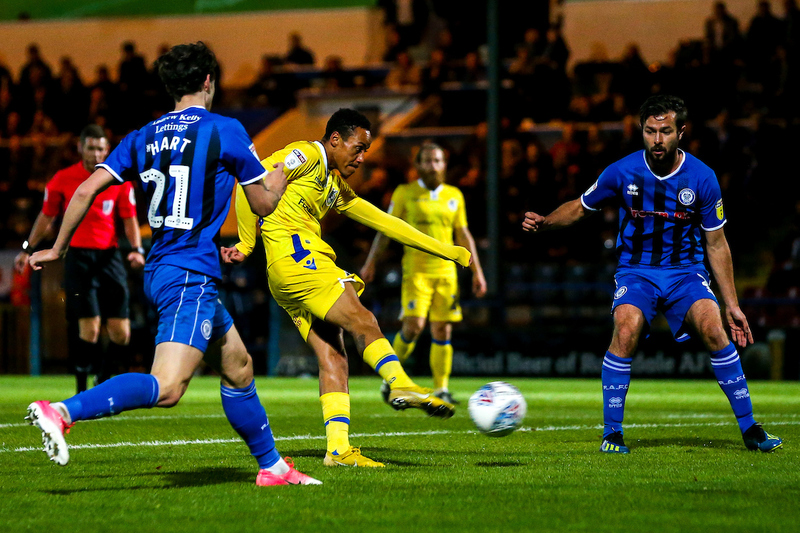 The opening fell the way of Kyle Bennett, as the winger was determined in his pursuit of a loose ball inside Rochdale area – he managed to fashion a right-footed volley that strayed narrowly wide of the goal frame. Bennett orchestrated the next opportunity for the away side, as the winger patiently advanced down the right and directed a path into space for Joe Partington. The right-back galloped forward and produced a teasing cross that fractionally missed both Stefan Payne and Liam Sercombe – with the pass requiring just the slightest of touches to turn it home. Perhaps the best chance of the first half fell of Rovers on the 15-minute mark. Stefan Payne picked up slack pass twenty-yards out from goal and launched a fierce shot that bounced back off the underside of the crossbar. Throughout the opening forty-five minutes, Rovers retained an attacking danger. Following on from Payne’s chance, Liam Sercombe ran with purpose towards the Rochdale area and managed to cut open the hosts defence with a purposeful run. The ball edged closer to Ollie Clarke, as the stand-in skipper took over and advanced through on goal, but his effort was smothered on the ground by the imposing Magnus Norman. Following a brief lull in the game, the action returned in full force in first-half stoppage time. A punctual long-ball forward caused a host of problems for the Rochdale defence. Stefan Payne used his pace to break to the ball first, as Magnus Norman was enticed off his line and was second to the ball and clattered Payne with a physical challenge. 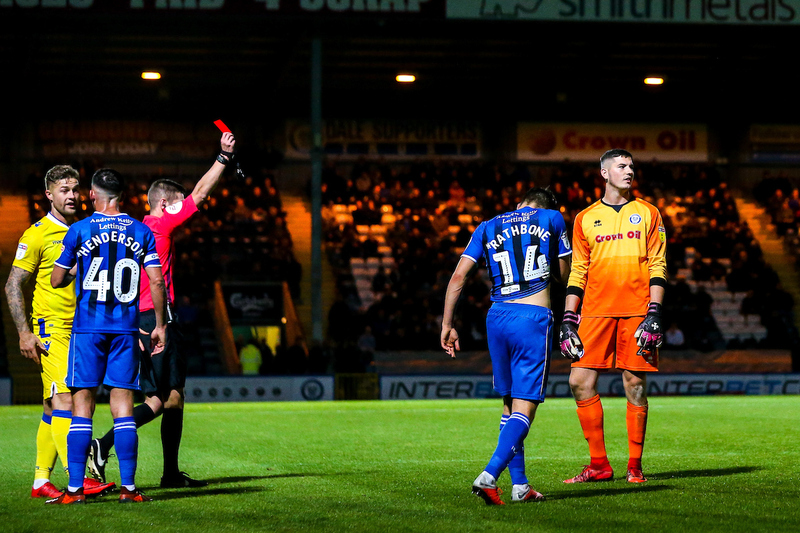 After a period of deliberation, where the referee consulted with his colleagues, a red card was produced for the goalkeeper, as Rochdale were reduced to ten men. From the set-piece, Liam Sercombe shifted a driven set-piece just past the post – as the deadlock remained in place heading into the break. To take full advantage of the extra man, Gavin Reilly was introduced at the break, as Stuart Sinclair made way for the striker. Despite a numerical disadvantage, it was the hosts that carved out the first opportunity of the second half. A delicate side-footed attempt from Oliver Rathbone looked like it had the potential to creep on target, but a strong hand from Jack Bonham pushed the attempt away from danger. Rovers found it frustrating when trying to unlock ten-man Rochdale, as Ollie Clarke’s driven attempt from twenty yards was the first effort to test substitute goalkeeper Josh Lillis. The long-range effort provoked a further chance, as a searching cross from Joe Partington wasn’t cleared and fell to Liam Sercombe inside the six-yard area. The midfielder poked a first time shot towards the target, but Lillis used his tall frame to deflect the effort away. With the contest opening up, Joe Partington started to maintain more of a threat down the right. It was a further cross from the right by the fullback that offered a further opportunity, as a low ball drifted into the path of Gavin Reilly. With the striker peeling away from his man, Reilly managed to factor room to shoot, but couldn’t adjust to deliver a more powerful attempt on goal. For the final two changes, Alex Jakubiak and Joe Martin were introduced – as Rovers continued the quest for a winning goal. As the final 15 minutes drew close, Liam Sercombe was next to test Lillis. The midfielder had time and space 20 yards from goal to produce a curling effort that forced the stand-in Rochdale goalkeeper to be alert. In the closing stages, a clipped ball into the Rochdale area was headed over the target by Liam Sercombe – as at the other end, Jack Bonham was called upon to make a crucial save to grasp an effort from Ian Henderson, as the forward broke in behind the Rovers defence. There were more anxious moments for Rovers, as a late free-kick was conceded in a dangerous location – but Sam Hart could only rocket the free-kick into the wall, as Rovers had to settle for a share of the points. Rovers XI: Jack Bonham (GK), Joe Partington, James Clarke, Tom Broadbent, Tony Craig (70′ Joe Martin), Chris Lines, Ollie Clarke (c), Liam Sercombe, Kyle Bennett, Stuart Sinclair (45′ Gavin Reilly), Stefan Payne (66′ Alex Jakubiak). Subs: Adam Smith (GK), Daniel Leadbitter, Rollin Menayese, Joe Martin, Ed Upson, Alex Jakubiak, Gavin Reilly. Rochdale XI: Magnus Norman (GK), Joseph Rafferty, Jimmy McNulty (45+1′ Josh Lillis), Harrison McGahey, MJ Williams, Oliver Rathbone, David Perkins, Bradden Inman (77′ Andrew Cannon), Sam Hart, Matthew Gillam (21′ Jordan Williams), Ian Henderson (c). Subs: Joshua Lillis (GK), Ryan Delaney, Calvin Andrew, Jordan Williams, Zach Clough, Andrew Cannon, Aaron Morley.